Wael Gamal is a leftist Egyptian journalist, researcher, and translator. He is a journalist with Al-Shorouk daily newspaper where he writes a weekly analytical column. 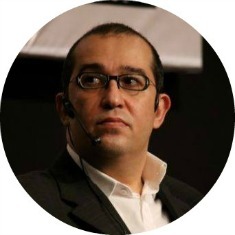 He has been active in the journalistic field for over sixteen years, during which he worked in print and broadcast media such as Al-Alam Al-Youm, Al-Ahram Weekly, CNBC Arabia, BBC, and Thomson Reuters. Gamal participated in the founding of Al-Shorouk newspaper as head of the economics division before becoming a managing editor in October 2009. He holds a degree in political science and economics from Cairo University and postgraduate diplomas in political science from Cairo University and finance and investment from Middlesex University. Gamal is one of the founders of Anti-Globalization Egyptian Group (AGEG) in 2002 and the popular campaign "Drop Egypt's Depts" in October 2011. He is also a certified trainer Thomson Reuters and the BBC.